ABOVE: Limmat River, Z�rich, with Grossm�nster's towers visible on the west bank.. 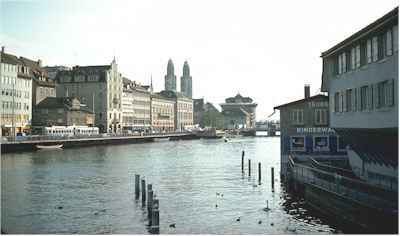 The Grossm�nster is on the west bank of the Limmat River, several blocks inland from the B�rkliplatz and the Z�richsee. It's almost directly across the river from another historic church, the Fraum�nster, which is just a few steps away from the Bahnhofstrasse in the main shopping and banking district. Instead of describing the church at length, we'll quote from a delightful book titled The Stories of Basel, Berne, and Z�rich, by M.D. Hottinger, which was published by J.M. Dent & Son of London in 1933. The book is no longer in print, unfortunately, although you may be able to find it in a bookstore or--as I did--in a university library. "As far back as human history goes, some kind of cult has been practiced on the moraine hill on which the Grossm�nster stands. Tradition [says] that the first minster was the work of Charlemagne himself, who has always enjoyed great popularity in Z�rich, and to whom every good work has been attributed for which no historical author existed. The light of history first breaks in upon the story when the old wooden minster was burnt down in 1078, and a new one in stone at once begun. By 1107 building was so far advanced that Mass could be sung in the crypt. Then comes a lull. There is no more talk of building on the minster until between 1170 and 1230, when the church we know was substantially built. Then it received the impressive rectangular choir with the three high windows such as we see again in more modest form in the Fraum�nster, while such decoration as the minster still shows was made. That decoration is characteristically high Romanesque. "It was Lombard masons who built the minster, and their hand is visible in the fine even courses of the masonry and in the capitals of the columns, some of which are of great beauty, although others are quite rough work. Two of these capitals, in the flat relief of the church, are especially interesting. On the third column on the north side of the nave, we see [the Z�rich martyrs] Felix and Regula with a mounted Emperor, presumably Charlemagne; on the corresponding south side, a curious scene in which two warriors are fighting; the hand of one is held by a man behind his back while he is stabbed by his opponent. Two other men dance for joy at the treachery. No meaning has been discovered for this strange scene. Presumably some story was current at the time, and the mason carved it for his own pleasure. "The minster as a whole is a grave and noble product of its time. To realize to the full what it was when first built, however, we must imagine it as built by a community of some eight thousand souls. This was no bishop's church like Basel. Rising above the cramped wooden houses, it must have been an inspiring testimony to the will of the people. "Even now it dominates the old town in quite a peculiar way. Its orientation is strange. It stands neither parallel to the Limmat nor in the axes of the compass. It rises like a rock in the sea. "The towers which Victor Hugo called "d'ignobles poivri�res" deserve special mention. For long they were unequal, low, and insignificant, simply roofed in with wood. In 1474 Charlemagne came to roost in his niche on the south tower. Who the horseman is on the north tower, nobody knows. Then Waldmann, who had seen the graceful spires of France, moved the council to erect similar ones on the minster, shingled in white and blue, the colours of Z�rich. The spires were certainly out of keeping with the grave forms of the minster, but they gave a gay and characteristic note to the town picture, as we can see from old views of Z�rich. "Then, in the eighteenth century, one of them was struck by lightning, and there was much discussion of what to do. Many were for removal of the whole building, as being to barbaric and primitive for the Athens on the Limmat. An "airy temple" in strict Classical style was suggested. From this horror Z�rich was saved by Breitinger, who not only pointed out the architectural beauty of the minster, but argued that it could not be unhealthy, as its parishioners lived as long as any other church in Z�rich. The telling argument won the day, and the minster was saved. "But the problem of the towers was still unsolved. G.M. Pisoni proposed for the purpose a marvellous mixture of Catholic baroque and eighteenth-century Gothic. However, even these were rejected, and after much discussion, the present towers were built. "Nobody could call these towers beautiful, yet they quite admirably fulfil a difficult function. They emphasize the great upward movement of the west front, which would have been checked by anything in the nature of Pisoni's invention. Nondescript as they are, they have lived themselves into the picture of Z�rich." London, J.M. Dent & Sons Ltd.